Prince Michael Andreas Barclay de Tolly[nb 1] (27 December [O.S. 16 December] 1761 – 26 May [O.S. 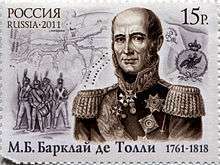 14 May] 1818) was a Russian Field Marshal and Minister of War during Napoleon's invasion in 1812 and War of the Sixth Coalition. Barclay de Tolly, a member of the Scottish Clan Barclay with roots in Towie (Towy or Tolly, Scottish Gaelic: Tollaigh) in Aberdeenshire, was born in Pamūšis, Courland and Semigallia (in present-day Pakruojis District Municipality, Šiauliai County, Lithuania) and raised in Jõgeveste, Livonia, Russian Empire (now part of Estonia). The commonly accepted birth date of 27 December 1761 is actually the day of his baptism in the Lutheran church of the town Žeimelis. He was a German-speaking descendant of a Scottish family which had settled in Livonia in the 17th century. De Tolly grew up in St.Petersburg and was raised by his aunt. As Gregory Fremont-Barnes and Todd Fisher state, who are amongst the world's leading Napoleonic-era scholars, this was a common occurrence amongst the German Protestants, and gave the young man the exposure to upper society unavailable in the Baltic provinces. De Tolly's grandfather served as the mayor of Riga, while his father Bogdan Barclay de Tolly had served in the Russian army before being admitted into the ranks of Russian nobility by the Tsar. De Tolly himself, the future field marshal, entered the Imperial Russian Army at the age of six, and would spend the rest of his life with the military. Young Barclay was enlisted in the Pskov Carabineer Regiment on 13 May 1767, and achieved the rank of a cornet by May 1778. In the same year, he joined the Imperial jaeger regiments, and joined alongside the rest of his unit the army of Prince Potemkin. In 1788–1789, during the Russo-Turkish War of 1787-1792, Barclay served against the Turks, under the command of Victor Amadeus of Anhalt-Bernburg-Schaumburg-Hoym. During this campaign, he distinguished himself in the taking of Ochakov and Akkerman. In 1789, he was transferred to the Finnish front during the Russo-Swedish War of 1788-1790, and four years later, he fought against the Poles. He was a lieutenant colonel by 1794 after serving as aide-de-camp to various senior officers in several campaigns. In that year he was appointed commander of the Estland Jaeger Corps, and three years later commander of the 4th Jaeger Regiment, becoming its chief in 1799, soon after being promoted to general major for his service in the Polish Campaign of 1794. In the war of 1806 against Napoleon, Barclay took a distinguished part in the Battle of Pultusk (December 1806) and was wounded at the Battle of Eylau (7 February 1807), where his conduct won him promotion to the rank of lieutenant general. After a period of convalescence, Barclay returned to the army and in 1808 commanded operations against the Swedes during the Finnish War. In 1809, he successfully marched over the frozen Gulf of Bothnia, which allowed him to surprise the enemy and seize Umeå in Sweden. For this exploit, immortalized by the Russian poet Baratynsky, he was made full general and Governor-General of Finland. A year later, he became Minister of War, retaining the post until 1813. During Napoleon's invasion of Russia in 1812, Barclay assumed the supreme command of the 1st Army of the West, the largest of the Russian armies facing Napoleon. He used the scorched earth strategy of drawing the enemy deep into one's own territory and retreated to the village of Tsaryovo-Zaimishche between Moscow and Smolensk, although some consider the strategy merely an confluence of diverse circumstances and not attributable to the will of one man. Nevertheless, the Russians keenly opposed the appointment of a foreigner as commander-in-chief. His rivals spread rumors of his being Napoleon's agent, and the populace condemned him as a coward. Barclay was forced by his subordinates and the Tsar to engage Napoleon at Smolensk (17–18 August 1812). Napoleon forced Barclay to retreat when he threatened Barclay's only escape route. After losing the Holy City of Smolensk, the outcry of officers and civilians grew to a point where the Tsar could no longer ignore it. He appointed Kutuzov, previously a general at the battle of Austerlitz, as the over-all commander of the Russian forces. Barclay remained General of the 1st Army of the West. Barclay commanded the right flank at the Battle of Borodino (7 September 1812) with great valour and presence of mind and during the celebrated council at Fili advised Kutuzov to surrender unfortified Moscow to the enemy. His illness made itself known at that time and he was forced to leave the army soon afterwards. After Napoleon was driven from Russia, the eventual success of Barclay's tactics made him a romantic hero, misunderstood by his contemporaries and rejected by the court. His popularity soared, and his honour was restored by the tsar. Barclay was re-employed in the field and took part in the German Campaign of 1813 and the French Campaign of 1814, which ended the War of the Sixth Coalition (1812–1814). After Kutuzov's death, he once again became commander-in-chief of the Russian forces at the Battle of Bautzen (21 May 1813), and in this capacity he served at Dresden (26–27 August 1813), Kulm (29–30 August 1813) and Leipzig (16–19 October 1813). In the latter battle he commanded a central part of the Allied forces so effectively that the tsar bestowed upon him the title of count. Barclay took part in the invasion of France in 1814 and commanded the taking of Paris, receiving the baton of a Field Marshal in reward. 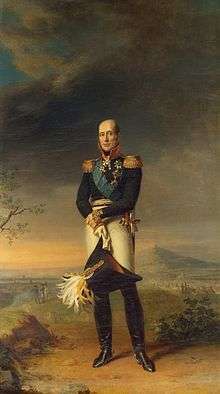 In 1815 he again served as commander-in-chief of the Russian army which after the Hundred Days occupied France, and was created prince at the close of the war. As his health grew worse, he left the military and settled down in his Jõgeveste manor (German exonym: Beckhof, Polish: Tepelshof) (nowadays Southern Estonia). 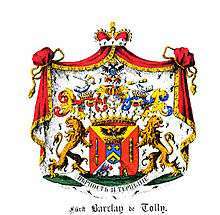 Barclay de Tolly died at Insterburg (Chernyakhovsk), East Prussia, on 26 May 1818 (14 May, Old Style) on his way from his Livonian manor to Germany, where he wanted to renew his health. 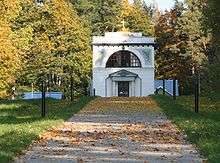 His and his wife Helene Auguste Eleonore von Smitten's remains were embalmed and put into the mausoleum built to a design by Apollon Shchedrin and Vasily Demut-Malinovsky in 1832 in Jõgeveste (in Helme, Estonia). Bust of Barclay de Tolly in Tartu, Estonia. 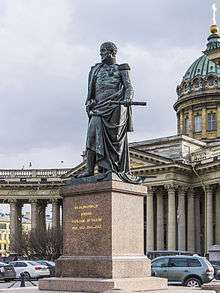 A grand statue of him was erected in front of the Kazan Cathedral in St Petersburg on behest of Emperor Nicholas I. There are also a modern statue in Riga, a full size bronze mounted statue by Vladimir Surovtsev in Chernyakhovsk, a bust monument in Tartu, and the so-called "Barclay's leaning house" in Tartu (which was acquired by his widow after his death). Order of Saint Louis, 1st class (France, 1816). The Nesvizhskiy 4th Grenadier regiment (the General-Field Marshal Prince Barklay-de-Tolli, Mikhail Bogdanovich's) was named for the Prince in 1880s. He was also the namesake of a short-lived Russian fortress in the Hawaiian Islands. 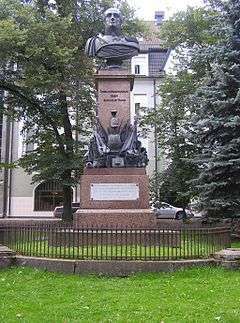 A statue of Barclay de Tolly was erected in 2001 in the Esplanade gardens in Riga, evoking an earlier 1913 monument that was destroyed during the 20th century. Whereas his lineage as a Baltic-Scottish Baron (and as such: Non-Russian) had caused him to be derided by Russian historians in the late 19th and throughout the 20th century in favor of Kutuzov, his image as a leader has undergone a positive reassessment in recent years. ↑ His ancestor emigrated from Towy (Tolly) in Aberdeenshire ca 1688. "CHAPTER IX. SCOTTISH FAMILIES SETTLED IN RUSSIA. THE COURT PHYSICIANS. ROGERSON. OTHER SCOTS - SIR James WYLIE, COUNT BARCLAY DE TOLLY, LERMONTOFF. CONCLUSION.". Scottish Influences in Russian History. p. 6. Retrieved 2015-08-26. The story of the family is this. They came to Russia during the times of the Revolution of 1688, from Towy (Tolly) in Aberdeenshire. 1 2 3 4 5 6 Fremont-Barnes & Fisher 2004, p. 172. 1 2 3 Nafziger 2001, p. 26. Fremont-Barnes, Gregory; Fisher, Todd (2004). The Napoleonic Wars: The Rise and Fall of an Empire. Fisher. ISBN 978-1841768311. Nafziger, George F. (2001). Historical Dictionary of the Napoleonic Era. Scarecrow Press. ISBN 978-0810866171. Chisholm, Hugh, ed. (1911). "Barclay de Tolly, Michael Andreas". Encyclopædia Britannica (11th ed.). Cambridge University Press. Helme, Rein (2006). Kindralfeldmarssal Barclay de Tolly (in Estonian). Tallinn: Eesti Entsüklopeediakirjastus. ISBN 9985-70-202-6. Josselson, Michael; Josselson, Diana (1980). The Commander: A Life of Barclay de Tolly. Oxford: Oxford University Press. ISBN 0-19-215854-6. Mikaberidze, Alexander (2005). The Russian Officer Corps in the Revolutionary and Napoleonic Wars, 1792–1815. New York: Savas Beatie. ISBN 1-932714-02-2. Wikimedia Commons has media related to Michael Andreas Barclay de Tolly.